At EXCELL, we’re a family of like-minded individuals committed to the advancement of the Physician Assistant profession. While our focus is on helping students get accepted to PA school, we know how to have fun! Check out our Facebook page for more. We treat current college students and aspiring PAs to fun “study break” events including bowling, pizza, and even trampolining! But most importantly, when our community succeeds – we celebrate together! Our first student, Lauren G. earns her Physician Assistant degree! Spots fill up quickly - don't wait! I really have to thank you because without EXCELL, this wouldn’t have happened. I feel like I was in another league during my interview compared to others because of how well you prepared me. provides pre-Physician Assistant Programs in NJ, including mentoring and mock interviews as well as an Online Physician Assistant Program Preparation Course. Complete our program so you can join the 6.7% of students accepted into Physician Assistant schools! 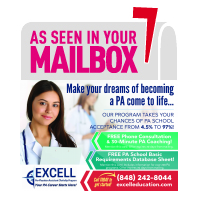 *Students included in our statistic have completed the entire EXCELL Clerkship Program, and met the requirements for and applied to at least six schools, which is the national average. Past results do NOT guarantee future results and EXCELL in no way implies that completion of our program will guarantee acceptance into any school.